As NASA’s New Horizons spacecraft rapidly closes in on the Pluto system on the outer fringes of the Solar System, its instruments are starting to reveal stunning details on the surfaces of both Pluto and its largest moon – Charon. These tantalizing new images are now raising new mysteries about these enigmatic worlds. These images came in at the close of this month, with the spacecraft slated to conduct a flyby of the system in less than two weeks’ time. Color images that were taken on June 25 and 27 show Pluto to have two very different faces. The encounter hemisphere, which the spacecraft will observe and measure at the highest resolution, shows a strange dark region extending along the planet’s equator. The other hemisphere, which faces Charon, features a row of four dark spots that are evenly spaced, each measuring approximately 300 miles (480 km) in diameter. Members of the mission team created the color images by combining monochrome photos of Pluto and Charon obtained from the Long Range Reconnaissance Imager (LORRI ) with lower resolution color photos taken by the Ralph telescope using its Multispectral Visible Image Camera (MVIC ). The resulting images are in near true color, meaning their appearances match what a nearby observer would see with the naked eye. The strange spots and the enormous variations in color on Pluto’s surface continue to stump scientists. Their even spacing and similar sizes could be clues about their origin. “It’s a real puzzle—we don’t know what the spots are, and we can’t wait to find out,” principal investigator Alan Stern emphasized. “Also puzzling is the longstanding and dramatic difference in the colors and appearance of Pluto compared to its darker and grayer moon Charon. Nothing like the row of dark spots has been found on any other celestial body in the Solar System. The dark region on the encounter side and the dark spots on the opposite side of Pluto are actually near its equator because the images show only half of the planet. Imager Bjorn Jonsson used the latest images to create an animation of Pluto rotating that shows the dark spots. The Ralph imager’s infrared spectrometer has detected frozen methane on Pluto’s surface, confirming what astronomers have known from Earth-based observations as far back as 1976. An odorless, colorless gas present on Earth’s atmosphere and beneath its surface, methane (CH4) can be produced by either biological or geological activity. Pluto’s methane could be left over from the original solar nebula out of which the Solar System formed about 4.5 billion years ago. The detection of methane on Pluto’s surface was originally made by a team of ground-based astronomers led by New Horizons team member Dale Cruikshank, of NASA’s Ames Research Center, Mountain View, California. A time lapse movie made from images of Pluto and Charon taken between May 28 and June 25 shows the two worlds growing larger as New Horizons’ distance to the system decreased from 35 to 14 million miles (56 million km to 22 million km). In the above movie, from New Horizons’ LORRI, shows Pluto and Charon as the spacecraft closes in. In the annotated version, Pluto’s prime meridian (the region of the planet that faces Charon) is shown in yellow and the equator is shown in pink. Pluto’s surface continues to show a strong color contrast, with a bright northern hemisphere and the dark regions near its equator. Charon shows variations in brightness at lower latitudes and a dark polar region which some have dubbed as an “anti-polar cap”. An important next step is the search for clouds in Pluto’s atmosphere, which will be conducted by both LORRI and the Ralph instrument. Finding clouds will enable the mission team to track both the direction and speeds of Pluto’s winds, said science team member Kelsi Singer, who is a postdoc at the Southwest Research Institute. A variety of techniques will be used to search for clouds during both approach and departure. New Horizons’ Alice ultraviolet imaging spectrograph prepared to take the departure images by successfully conducting a test observation of the Sun on June 16 from a distance of 3.1 billion miles (five billion km). Immediately following its closest approach, the spacecraft will turn toward the Sun and observe it from behind Pluto. Studying the passage of sunlight through Pluto’s atmosphere will enable scientists to determine the atmosphere’s composition. In a lucky coincidence, Pluto occulted a star on the morning of June 30 New Zealand time (June 29 in the U.S.). 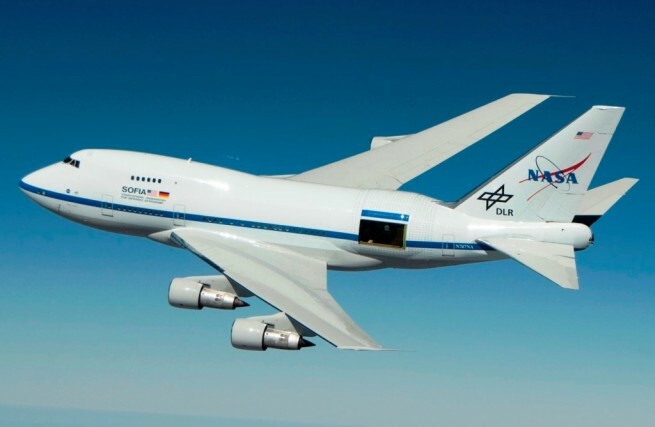 Using the Stratospheric Observatory for Infrared Astronomy (SOFIA ), a Boeing 747SP jetliner modified to carry a 100-inch (2.5-meter) diameter telescope, astronomers successfully pinned down Pluto’s position and confirmed that Pluto’s atmosphere is still present and has not completely frozen onto its surface. During an occultation, a planet passes between the Earth and a distant star, causing a faint shadow of the planet to rapidly pass across the Earth’s surface, a phenomenon that presents ideal conditions for scientific analysis. SOFIA program scientist Pamela Marcum, who works for NASA’s Ames Research Center, said observations made during the occultation will reveal detailed measurements of the density and structure of Pluto’s atmosphere. “This flight adds to our understanding of how the atmosphere of Pluto evolves over multiple-year time scales as its elongated orbit takes it farther away from the Sun,” Marcum stated. Several members of New Horizons’ science team are also co-investigators for SOFIA. They received immediate access to the occultation data, which will be made public through SOFIA’s scientific data archive in July 2016. “New Horizons will give us comprehensive ‘snapshot’ measurements of Pluto for which ongoing occultation studies provide context. This unique opportunity to connect what SOFIA observes remotely with in-situ measurements from New Horizons will allow future [analysis] of Pluto from Earth by SOFIA and other observatories to be considerably enhanced,” Marcum said. SOFIA’s observations of Pluto so close to the flyby will play a key role in linking ground-based studies of the dwarf planet with data from the New Horizons encounter for decades, said New Horizons co-investigator Cathy Olkin of the Southwest Research Institute. Meanwhile, the Pluto Energetic Particle Spectrometer Science Investigation (PEPPSI) instrument is studying the space environment near Pluto to determine the amount of Pluto’s atmosphere that is escaping and the speed of its escape. It does this by looking for escaped ions (atoms that have lost or gained one or more electrons) which have become caught up in the solar wind – the stream of subatomic particles emanating from the Sun. PEPPSI is already sending data back to Earth, daily. With a seven-week search for hazards having turned up no rings, no new moons, nor dust clouds, the mission team has decided it is safe for the spacecraft to proceed along its originally-planned path as opposed to changing to an alternate one known as the Safe Haven by Other Trajectory (SHBOT). The last opportunity to make any such corrections is on Saturday, July 4. As of late June, LORRI has been capable of detecting moons 15 times fainter than the system’s dimmest moon, Styx. The decision to stay on the original course was made based on images taken June 22, 23, and 26. In the above image, the known small moons, Nix, Hydra, Kerberos, and Styx, are visible as adjacent bright and dark pairs of dots, due to their motion in the 105 minutes between the two image sets. On June 29, the mission team conducted a small course correction, using a 23-second thruster burn to increase New Horizons’ velocity by approximately one-half mile per hour (27 cm per second) to assure the spacecraft arrives exactly on target for both the time and position of the July 14 encounter. All flyby observations depend on exact timing and accuracy because computer commands are programmed to be carried out at very specific times and locations. The spacecraft and its instruments are healthy. As of July 2, it is approximately 10 million miles (16 million km) from the Pluto system. Oh boy this is going to be so cool. Cant wait for the fly by. An incredible mission and the world awaits the pictures yet to come. Genius, pure genius!